New grandbaby should arrive late today or tomorrow! My DD is in the hospital right now and the process will begin shortly. We know she is having a boy, so I made this card to welcome my newest grandson. I wish I could be there, but alas, she's in London, England, so I'll have to wait for a picture later. This card is a Featured Stamper card, FS64, from last Sunday on SCS. You can see the deets here. My card is based on this card by Michelle - aka (Sf9erfan). 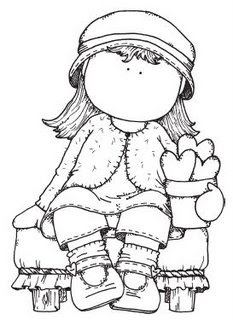 The little lamb is a digital image from Pink Petticoat. I coloured it with Copic Markers and added some Arctic Ice Stickles. I love how it turned out. I used a white base and layered that with Brocade Blue and Soft Sky. Groovy Guava was used for the accent colour and the ribbon. The two largest circles were cut and embossed using the Nestabilities system in my Cuttlebug. The sentiment is the only thing stamped on this card and I can't remember who made it. I do know it was a clear, acrylic stamp though. Oh, I had fun with the sketch challenge today. Here is my card for SC174. 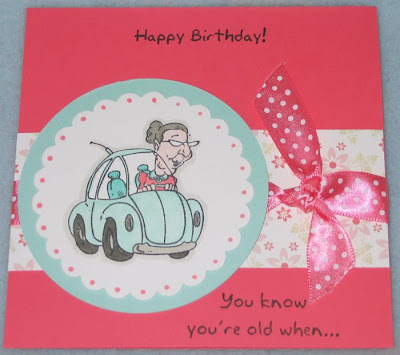 I love the You Know You're Old When... set from Gina K. Designs. This set is going to be used over and over and over again and that's because I'm of an age where all my friends are "gettin' up there", so to speak! 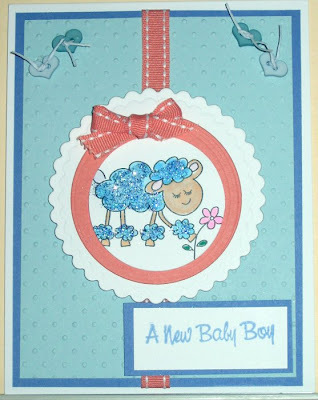 I started with Taken with Teal for the base and used some DP from Doodlebug Designs. I must admit that I had to refer to the SU colour wheel for an accent colour and so that's why the Apricot Appeal shows up on the card. I like the combination. I coloured the image with Prismacolor pencils and Copic Markers. The addition of some silver brads completed the look. It's going to an old friend who will be 61 next week! 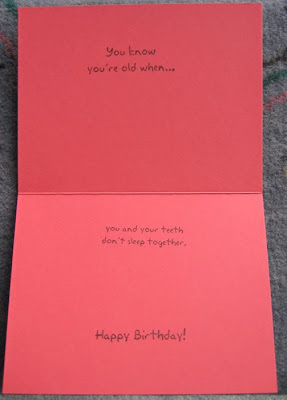 Oh yeah, the inside of the card says, "everything hurts ~~ and what doesn't hurt doesn't work." Where does the time go? My last post was Thursday past already! Of course, much has happened since then....we sold our house on Thursday, it passed the home inspection on Saturday and we purchased a new residence on Sunday. I guess I can be forgiven not posting for a few days. We'll be taking possession of our condo in Guelph on July 25th. I can't believe how everything just came together so smoothly. Well, yes I can, actually. I have God looking down on me and providing what I need when it's needed. Thanks be to God. This card was created for today's CC164 over at Splitcoaststampers. The colours for this challenge were Basic Black, Purely Pomegranate and Soft Sky, a lovely combination. I had no idea where to start, other than the colours. I took out the new "Owl Always Love You" stamp set by Gina K. Designs. As I was trimming the stamps, I noticed the sentiment and, whammy, it was perfect for the card I wanted to make. My son, Andrew, and his fiance, Sheena, just took possession of their new house last Friday. Congratulations you two. I coloured the image using Prismacolor pencils and blended it with Gamsol using a Q-tip. I had much better luck blending with the Q-tip than I ever did using those fancy blending stumps! This is the way to go, for me, at least. The addition of the brushed brass brads completed the look and now it will go into the mail. Oh, I almost forgot. I used some of that Metallic Rub-on Paste, also from Gina K., on the edges of the stamped image. I think it turned out pretty good for a first effort. Mojo34 and a couple of other cards, too! I love the Poetic Artistry challenges. They're aptly named "Mojo Monday Week ---" because it certainly kick-starts my week. I look forward to checking it out each week, although I don't always make a card. This week, I did. 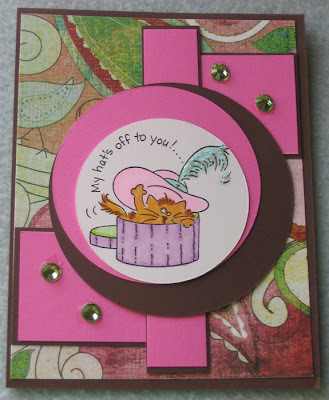 The base of the card is Chocolate Chip with Pixie Pink and some lovely DP by Basic Grey called Phoebe. I still have a few bits and pieces of this DP and am always happy when I get a chance t use it. Fluffles the Cat image was stamped in Palette Hybrid Black ink onto Select White c/s. Using my fabulous Copic Markers, I coloured him up and Stickled him, too! Well, the feather, at least. I added some crystals from Stamping Bella in peridot green and decided that was enough 'bling' for Fluffles, even though he is somewhat flamboyant! I've had the Hannastamps set since before I went into the hospital on February 13th. I'm embarrassed to say that yesterday was the first time she's been inked up. More importantly, it won't be the last time, though. Housekeeping Hanna was stamped onto Select White c/s with Black Palette Hybrid ink and coloured in with Copic Markers. 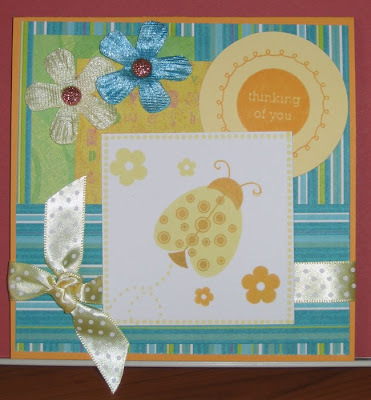 The base of the card is Lemon Tart by PTI (newest colour this month). I added some patterned paper from my stash for colour and interest. Square brads by Making Memories were used on the corners and then I added a new flower by Bazzill. These feel like textured felt and in the centre I placed another MM brad. The sentiment is exactly how I feel since I'm trying to keep the house tidy for this 'House for Sale' phase of our life. It's too clean and not enough stamping is being accomplished. So there! And last, but not least, is a card I made for my physiotherapist. I know, you'll say you made one already, but, that was for the student-physiotherapist. This is for my regular lady, Tarja (pronounced Tarria). I believe she is Finnish. I woke up this morning around 5:30 a.m. with this layout on my mind. So, I got up and went straight to my craft room to implement it. What do you know, it worked. The card base is Select White by PTI (love the quality of their c/s). The largest straight rectangle from Nestabilities was used to cut the card front. Next, I used the Swirly Birds embossing folder on Lemon Tart and adhered it from the inside of the card. I'm surprised I got it right the first time as I have been known to get it backwards on occasion! 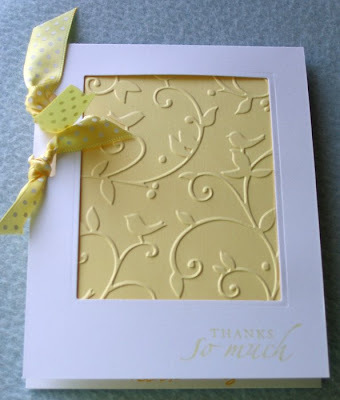 I stamped "Thanks So Much" from SU's Sincere Sentiments and added some Swiss Dot Lemon Tart ribbon and called it done. I think it looks very elegant. All in all, I feel I've had a very productive morning and it's only 10 a.m. 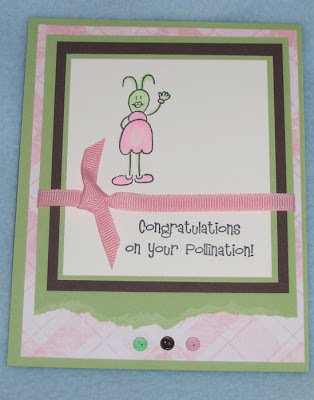 This is the card I made for Katharina's Sketch # 2 over at Papertake Weekly Sketch Challenge. Go check it out and join in the fun. 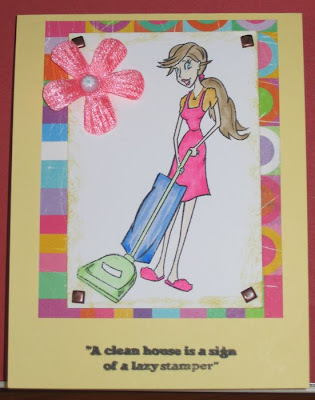 This card utilizes all things Papertrey Ink, from the cardstock, the images, the ribbon and even the ink. There were three exceptions and I will tell you about those as I describe the making of this card. I began with the newest cardstock, Summer Sunrise, for the base. Then I added layers of patterned paper which are from HOTP, their Citrus line. The circle was cut from Lemon Tart cardstock, also new this month. The main image is from the Little Lady set. I stamped the base of the ladybug using Lemon Tart ink, then stamped the spots in Summer Sunrise. The flowers were stamped in the same colours. Man, even the white c/s is Select White. On the white square, I stamped the edges using the Faux Ribbon set and on the circle, I used the Borders & Circles set which includes the sentiment. I layered it beginning with the striped paper, then added the green circles and the yellowish letters. Next came the circle and then the striped paper along the lower portion with the stripes going in the opposite direction. Now it was time to add the ribbon which is from the Lemon Tart collection. I finished it off with some Bazzill flowers and some glitter dots from Gina K. Designs. I really like this sketch and will use it again because of its versatility. I had some play time today, yay! I'm tellin' ya, ladies, trying to keep a tidy house for house viewings is difficult. I really feel for those women who are selling their houses AND have children to look after as well. There is just the two of us here and it's hard enough. We had people here on Saturday, and Open House on Sunday, people here Monday, agents' tour this morning and now someone coming over tonight at 7 pm. I know it's all good, but it sure does cut into my play time. That being said, I loved the challenges on the Gina K. Forum on Sunday night and just had to participate. Only now did I realize there were three challenges, but I only have two completed. 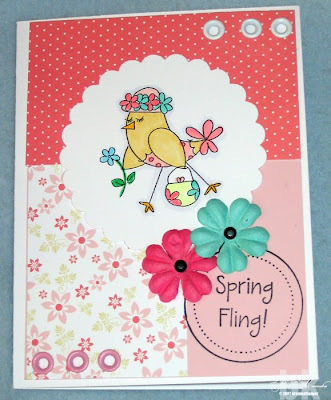 Here's my card for April Release Challenge # 1 by Carolyn King. Duh! There seems to be a problem uploading, so I'll put a link here to my SCS gallery and fix it later. Front of Card and Inside of Card. I used Berry Sorbet by PTI as the card base and put a strip from their Pink Patterns and then added some Swiss Dot ribbon, also in Berry Sorbet. I cut a circle of Aqua Mist and used my Marvy Giga Scalloped punch, with Select White by PTI for the image. I used the You Know You're Getting Old When....set for Challenge #1. And, for April Release Challenge # 2 by Erika Martin. Here's the link to my card. This card started with a base of Certainly Celery. I placed a layer of patterned paper by CTMH that is close enough to Pretty In Pink. The image was stamped onto Very Vanilla and double-matted in Chocolate Chip and Certainly Celery. The set I used was Getting Buggy, which I just love. I added some pink grosgrain ribbon and some button brads to finish it off. You just have to go look at the pics, please. This card also meets the criteria for the Colour Challenge today, CC163. My goodness these posts are boring without pictures! I hope it gets fixed soon by Blogger! YAY! BLOGGER IS FIXED. Have you seen Hänglar & Stänglar stamps or images? If not, here's a chance to win some. Hänglar & Stänglar images, and a stamp, are being given away as blog candy by Katharina for her 30th birthday, which was April 17th. Just visit her blog, Creative ideas by Katharina, to enter. Here's a picture of the stamp Katharina is giving away. These images are so darling and I would love to win them myself, but wanted to let my readers know about this fab opportunity, too! So, quickly now, go enter. You have until April 25th, Middle European Time to enter. You can click on the link in this post, or go to Katharina's blog via my blogroll, either way will get you there. And, if I don't win, I hope YOU do. Will Spring never arrive? Just this past Friday we had a snow storm. I mean, really, enough is enough. However, today is gorgeous and it should get up to around 11 degrees C. today and higher tomorrow and Wednesday. So, in an effort to get my mind into Spring, I made this delightful card. This image is one of several digital images available from Pink Petticoat in the UK. I downloaded them and tried to print them out, but my printer does not take cardstock easily so what I ended up doing was loading my images onto a thumb drive and took it to Staples. For $2.67 I was able to get all 52 images printed out. Now all I have to do is trim them, colour them and mount them on a card. I purchased the Fishes, Ewes, Owls and Birds images for a mere $16.00 CDN (approx) and, if it only costs $2.67 to print all the images, then I think that is a very economical way, indeed, of enjoying my craft. The only stamped image is the sentiment and that was $1.50 at Michaels! The card base is Select White with some Sweet Blush on the card face. Then I added some of the Pink Patterns paper, some pink and white eyelets and a couple of Prima flowers to complete the card. The cardstock and patterned papers are from Papertrey Ink. I used my Copic markers to colour the image and am happy to report that there was no bleeding of the image whatsoever. Can't wait for the next delivery of more Copics from the Gina K. Copic Marker Club. Should be any day now and that's only 'cause it takes longer to get to Canada. You can find out more information about this club by contacting Gina here. 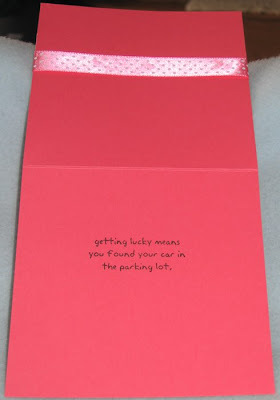 This is a very special card, for a very special young woman. Unless this is your first visit to my blog, you all know that I recently (8 weeks ago) had bi-lateral knee replacement surgery. I'm doing really well and, in fact, seem to be about 3 - 4 weeks ahead of the recuperative schedule outlined in most of the articles I've read. I attribute this first to God for looking after me, to the prayers of all my very special cyber friends, my family and, last, but definitely not least, to the physiotherapy I've been receiving over the last several weeks. I am fortunate enough to have two physiotherapists, Tarja, and a young woman, Kelly, a student at McMaster University in Hamilton. Kelly is doing her very first work placement at St. Joseph's Hospital and I'm her very first patient. Under the very capable supervision of Tarja, Kelly has made sure that I'm doing all of the right exercises. She's with me every step of the way making sure that I'm getting just the right amount of stretch or flexion, riding a recumbent bike, walking straight, and a myriad of other things that need to happen before I'm declared 100% following the surgery. Tomorrow is Kelly's last day of the 6-week work placement and I wanted her to remember her first patient (me), so I made this card for her. This card is based on BSC23 over at Splitcoaststampers. Thanks, Jamie, for a terrific sketch. Kelly actually looks a lot like Barbella. She's slim, trim, blonde and I'm sure she must be physically active if she's choosing a career in physiotherapy. Kelly knows the muscles in the body and how to get them to work after years of non-use (me, again). I wanted the card to reflect the benefits of working-out and thought Barbella was the perfect choice. The cardstock and patterned papers are by SU in one of their scrapbooking packages. I love the colours, but don't know the names of them. The ribbon is by PTI, in the Auqua Mist colour which matches perfectly with the SU colours here. I added the brass brads and photo hangar for pizzazz. The image was stamped on Selecte White and sponged with Aqua Mist. Okay, that's it for know. I just wanted to say 'thanks' to Kelly for working with me and helping me to get back on my feet. Good Luck in your studies, Kelly. I have both sets, "Way To Go" and "You Know You're Old When....". Yesterday I completed some cards for a swap at The Stamp Shack. Here is my creation. Well, it's not really my creation as I totally CASED it from here. I was perusing the gallery at SCS and fell in love with the card by Mothermark. I truly hope she is flattered that I used her design. I used some of my newest cardstock from Papertrey Ink in Berry Sorbet and Sweet Blush, then added some SU Chocolate Chip, as well. There was a lot of cutting involved in this card, but well worth the time it took, I think. I did have a difficult time getting the colour of the gums just right. It took two different colours of Copic Markers: V000 - Pale Health and R11 - Pale Cherry Pink. For the teeth, I used E50 - Eggshell. Only movie stars and talk show hosts have really white teeth! 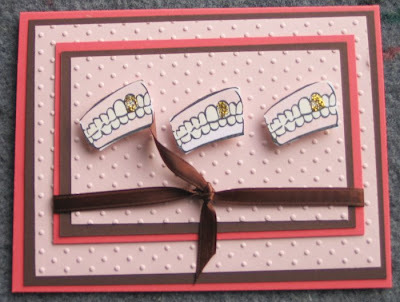 Oh, and did you notice that I used Gold Stickles on one of the teeth for some added pizzazz (my new favourite word). The cards are now on their way to the hostess of the swap and I can't wait to receive my cards back to see what other fabulous cards my fellow-swappers have created. I want to go play some more now, so see you soon. I'm back in the game of challenges. There is no better way to 'kick-start' oneself than to work on some challenges. Julee's Mojo Monday's at Poetic Artisty is probably my favourite. Here's my entry for Week #31. 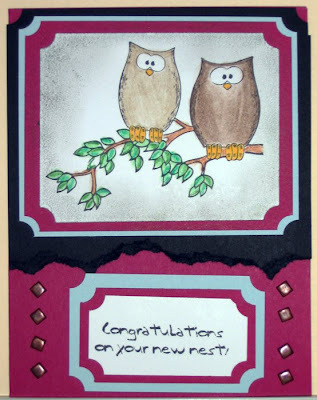 All of the supplies used in the making of this card are from Papertrey Ink. I began with White Select cardstock for the base. Then I added a 2" strip of Spring Moss on the left, and a 3-1/2" piece of Aqua Mist on the right. Layered on that is a piece of patterned paper from the Everyday Blessings pack. The vertical piece is 2" wide by 4-1/4" long. Then I added a 3" square bit of the same paper, only adhered so the stripes are horizontal. For the next step, I used my Nestabilities for the scalloped and plain circles. 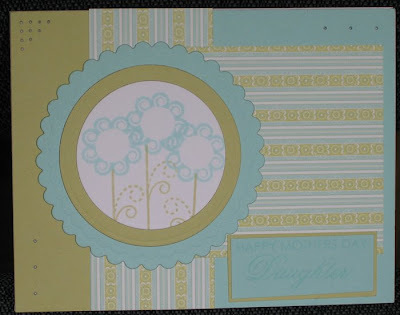 Both the Spring Moss plain circle and the Aqua Mist scalloped have also been embossed. The image and the sentiment are from the Women in Life stamp set. The sentiment was stamped with Aqua Mist ink onto a piece of Aqua Mist c/s, but it doesn't show up as clearly as I would have liked, however, we learn by doing! In case you can't see the sentiment, it says, "Happy Mother's Day, Daughter". I completed the card with some paper piercing in three of the corners. Overall, I think it's a very gentle-looking card.